If you're in between sizes and have a full waist, we recommend ordering up. The fabric doesn't stretch. 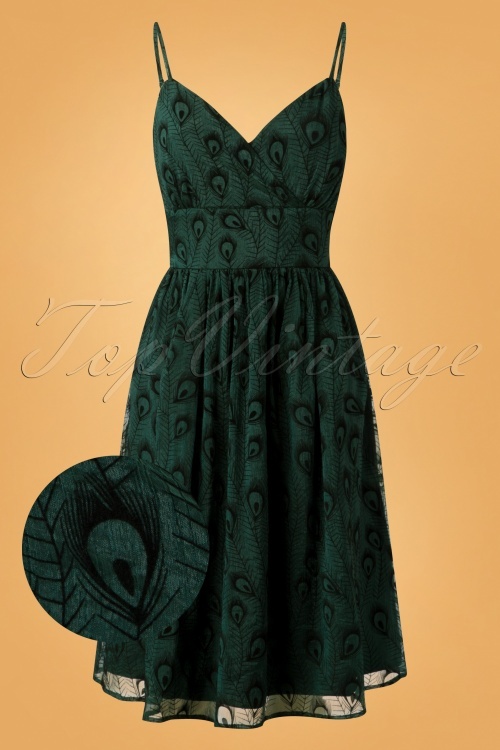 As proud as a peacock in this 50s Leah Peacock Flared Dress in Green! 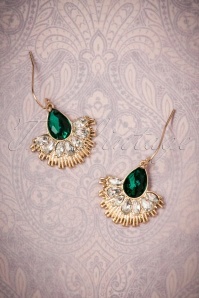 Fabulous, fashionable and the centre of attention? Sounds like peacocks and Vixens have a thing or two in common! This flowy dress features a flattering wrap over, a fitted waist band and an elegant semi-swing skirt for a gorgeous feminine silhouette. 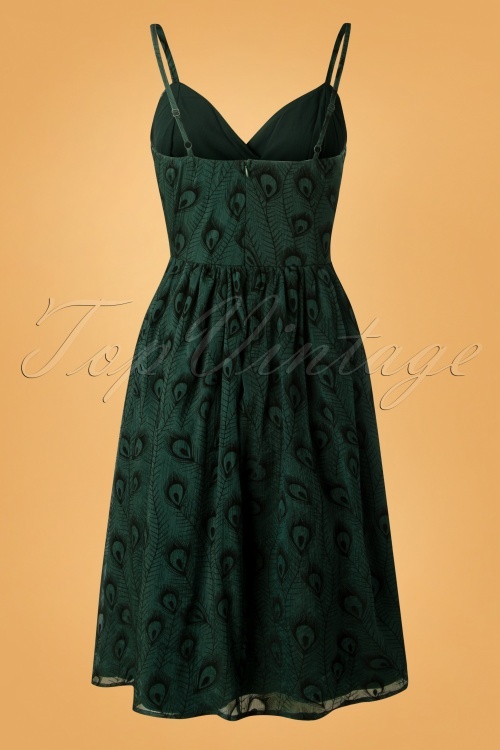 Made of a semi-sheer, dark green fabric (doesn't stretch!) 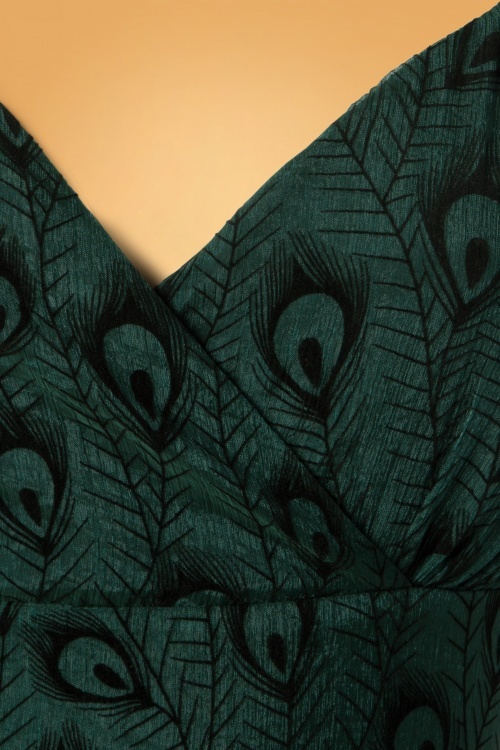 featuring a breathtakingly beautiful, black flock print of peacock feathers and she is fully lined. 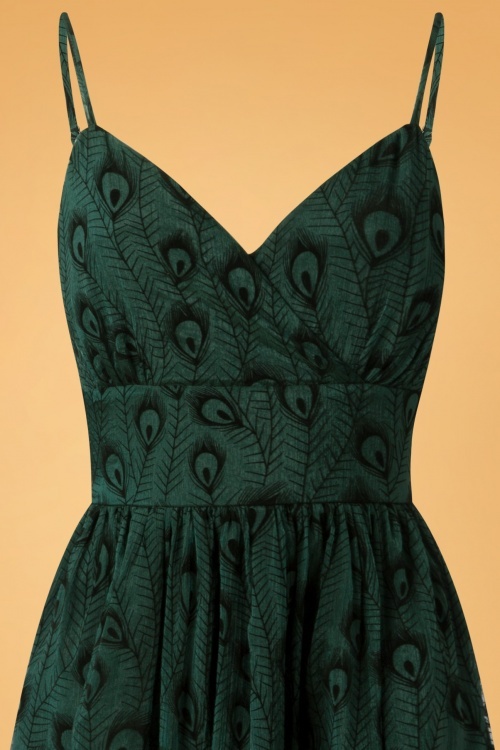 Show off your feathers like a proud peacock in this stunning evening dress! This dress (ordered in M) fits me perfectly. The length is great (just underneath the knees), so I don't have to shorten it as I usually have to (as I am rather on the short side with 1.57m). The waistline is great and what is more: although I feel uncomfortable without one in general, I do not need to wear a bra in this one. Bis eben war ich noch schwer verliebt in dieses Kleid. Stoff, Muster und Farbe sind wundervoll. Ich habe es bereits einmal getragen zu Weihnachten (sogar ohne BH, nur mit Nippelpads, da der Brustnbereich nicht gepolstert/gefüttert ist). Ich habe es mir gerade noch einmal angeschaut und musste feststellen, dass sich an der Taille schon ein Stück Naht gelöst hat, sprich, dass dort ein Loch ist! Und das obwohl das Kleid mir an der Taille sogar zu locker sitzt, also keinerlei Spannung oder ähnliches die Naht belastet hat! Und das nach nur EINMAL tragen und ich habe das Kleid noch nicht einmal gewaschen bis jetzt. Das ist wirklich sehr schade und macht mich etwas traurig. Hallo Florentine, entschuldigen Sie uns bitte dass Sie ein Kleid von mangelhafter Qualität erhalten haben. Das hätte nicht passieren dürfen. Ich werde mich heute noch bei Ihnen melden und dann werden wir das Problem lösen.